"LA PRUEBA" 99, OBRAPIA St.
GEORGE W. MACE, San Crist6bal. EXECUTIVE COMMITTEE: S. S. HARVEY, Havana, WILLIAM H. ROBERTS, Giiines, Col. H. E. HAVENS, Herradura, CLIFT F. AUSTIN, Santiago de las Vegas. TRANSPORTATION.-L. S. Mc Irwin, Guanabacoa; S. L. Laughlin, Taco-Taco; W. R. Roberts, Giiines. PACKAGES & PACKING.-W. R. Roberts, Giiines; S. S. Harvey, Havana; F. S. Eearle, Herradura. MARKET & STORING.-H. E. Havens, Herradura; C. S. Austin, Santiago de las Vegas; I,. S. Mc Irwin, Guanabacoa. CITRUS FRUIT.-C. F. Austin, Santiago de las Vegas; J. J. Howard, Santiago de las Vegas; Prof. C. F. Baker, Santiago de las Vegas; V. Vuillaumrne, Herradura. VEGETABLEs.-P. J. Putman, Taco-Taco; E. W. Halstead, Santiago de las Vegas; P. P. Echarte, Giiines. Havana; Ernesto Dumas, Santiago Nipe Bay; Thos R. Tows, Holguin; C. F. Baker, Santiago de las Vegas. ORNAMENTALS.-H. H. Norton, Herradura; H. A. Von Hermann, Santiago de las Vegas; C. F. Baker, San-tiago de las Vegas. ORCHARD MANAGEMENT.-G. WV. Mace, San Cristobal; A. B. Storms, Herradura; Win. P. Ladd, Santiago de las Vegas. LEGISLATION AND RELATIONS WITH GOVERNMENT.-S.
S. Harvey, Havana; H. E. Havens, Herradura; W.
ARTICLE I. 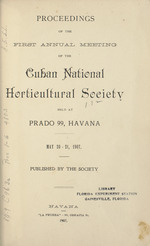 The name of this Association shall be the Horticultural Society of Cuba. ARTICLE II. Its object shall be to advance the horticultural interests of Cuba in all branches. ARTICLE ini. The members of this society shall consist of persons interested in raising the products of the soil, or its allied interests. ARTICLE IV. Any person who is interested as per Article iii may become a member of this society by making application to the Secretary and paying the annual dues. ARTICLE v. The officers of this society shall consist of a President, Vice-President, Secretary and Treasurer, and of an Executive Committee of five members, one of whom shall be the President. These various members shall be elected by ballot at the annual meeting, and shall hold office until their successors are elected. ARTICLE VI. The duties of the officers of this society shall be those usually performed by the officers of like organizations. ARTICLE VII. This constitution may be amended at any annual meeting of this society by a two thirds vote of the members present. 1. The annual dues of this society shall be one dollar Am. currency. II. The Executive Committee shall have power to fill all vacancies which occur between the annual meeting. 111. The Standing Committees of this Society shall consist of three, or more, members, and shall be appointed by the President after the approval of the Executive Committee. TV. The Chairman of each Standing Committee shall make a written report for each annual meeting, and as often between meetings as may be requested by the Executive Committee. 3. Marketing and Storing of Fruits. 8. Fruits of the Temperate Zone. Q3. Legislation and Relations with Government. Austin, C. F., Santiago de las Vegas. Alfonse, Lorenz SAnchez, Havana. Benson, Portland, Ceballos. Barker, J., Havana. Beit, W. R., Havana. Cuba Colony Co., Battle Creek, Mich. Collins, L., Herradura, Cuba. Earle, F. S., Herradura, Cuba. Graves, C. E., San Cist6bal, Cuba. Guetschow, John, Ceballos, Cuba. Havens, H. E., San Crist6bal, Cuba. Harvey, S. S., Havana, Cuba. Hendickson, H. C., Havana, Cuba. Handback, J., San Crist6bal, Cuba. Hamburger & Co., New York City. Hermanson, H., Artemisa, Cuba. Hotchkiss, E. L., Havana, Cuba. Huelsenkamp, C. J., Bacuranao, Cuba. Harvey, F. K., Havana. Idner, G. W., West Palm Beach, Fla.
Johnson, C. M., Havana, Cuba. Jacobson, Einer, Punta Brava, Cuba. Johnson, Oscar, Punta Brava, Cuba. Jenkins, R. C., Holguin, Cuba. Kurmuel, Edward E., Havana, Cuba. Kydel, J. H., Ceballos, Cuba. Kelsey, F. M., San Crist6bal, Cuba. Kendell, R. F., Holguin, Cuba. Kiser, WV. G., San Crist6bal, Cuba. Lewis, Chas. S., Herradura, Cuba. Ladel, W. P., Santiago de las Vegas, Cuba. Leahy, J. F., Detroit, Mich. Leahy, R. P., Havana, Cuba. Laughlin, S. L., Taco-Taco, Cuba. Manstrom Bungham, Artemisa, Cuba. Mace, G. WV., San Crist6bal, Cuba. Mc Irwin, L. S., Guanabacoa, Cuba. Olcutt, H. H., Franklin, Pa.
Putman, P. J., Taco-Taco, Cuba. Parker Neweel, San Marco, Cuba. Storms, A. B3., Herradura, Cuba. Stewart, C. WV., Havana, Cuba. Sorkel, Nestor, Artemisa, Cuba. Salo, Miss Seraphine, Punta Brava, Cuba. Storms, L. P., Herradura, Cuba. Storms, L. E., Mineapolis, Minn. Towns, Thos. R., Holguin, Cuba. Thompon, W. Jr., Havana, Cuba. Vuillaume, V., Herradura, Cuba. Verhus, J. A., Taco-Taco, Cuba. Van, Herman, Saniago de las Vegas, Cuba. WVilliams, A. H., San Antonio, Cuba. Report of the first annual meeting. The Cuban Horticultural Society held their first annual meeting in Havana May 20th, 1907, at 99 Prado in the Masonic Lodge rooms. Meeting called to order by Pres. F. S. Earle at 12 noon. Minutes of the primary meeting held the previous Spt. read and approved. "It is usual in bodies of this kind for the president, in his annual address, to sum up the progress of the work for the past year. In the present case if I were to confine myself to the work of our society my address would be a short one, even if I were to include an account of the adventures of our worthy secretary and myself while trying to reach our homes after attending the first meetting which was held, as you will remember, during the strenuous revolutionary times of last fall. "Our work so far has merely been that of organization. Today, for the first time, we hope for something in the way of accomplishment. I cannot either attempt a review of the present status throughout the inmense field of Cuban horticulture, for my knowledge is not sufficient. Such an attempt would be sure to degenerate into a mere list of the innumerable things that we would like to know. be justified in confining myself to a statement of views as to what should be the purposes of this society. "This fundamentally important matter has been given consideration by your executive committee, and the result of their deliberations has taken shape in the appointment of the various standing committees whose reports we expect to hear during this meeting. I can probably best accomplish my purpose, therefore, by taking up these committees in order and discussing briefly the field that each is expected to cover. The first on the list, and perhaps the first in importance, is that on transportation. Success or failure in handling perishable products depends directly on transportation facilities. The history of our business in every new region has shown that transportation companies everywhere have to be educated as to the needs of the fruit and vegetable industry. "It h as also been shown that they are willing to learn, when properly approached, and that when they really come to appreciate the importance of this business they are ready and willing to furnish the proper facilities, It will be one of the most important functions of this society to formulate our needs in this direction, and bring them forcibly to the attention of the transportation companies. Our members in each community should communicate their needs and grievances to the transportation committee, in order that it may be supplied with the fullest possible data as to the actual situation. Speaking for my own sections, our great present needs are for ventilated cars and a night fruit train. It is simply barbarous to put fruits and vegetables in ordinary box-cars. The only freight train leaves Pinar del Rio early in the morning and reaches Havana too late to be unloaded till the next morning. In order to catch the Saturday steamer, therefore, we have to pick and load the car Thursday. Those who have large crops must begin picking Wednesday. To reach Havana our goods must lie 36 hours in a box-car. The matter of refrigerator transportation on the steamers is another one that should receive our attention. I am confident it can be arranged for, if the members of this society unite in requesting it and in agreeing to utilize refrigerator space if provided. To make this really useful, however, it would have to be supplemented by a refrigerator car service on the railreads, so that the goods may be cooled as quickly as possible after picking. The committee on packages and packing is especially charged with studying the problem of securing cheaper acl'aages. Those now imported from the States are expensive. \What are the possibilities of manufacturing them here? The whole matter of proper packing is, of course, one of vital importance. If this society could devise some means whereby all Cuban produce should be carefully and properly packed, it would do more to establish the reputation of Cuban goods and to increase the returns received for them than any other one thing. Why is it that Florida and California products are always quoted higher in the market than Cuban goods? This society should see to it that in the future this shall not always be the case. since marketing in its broadest sense would include both packing and transportation. It includes, however, many other problems and this committee, it was hoped, might investigate the methods of selling adopted by other communities. At present most Cuban goods are sold through commission houses in Northern cities. Is this the most desirable plan? How feasible it is to encourage buyers to take the goods in Havana? What about the auction house system of selling so widely adopted by the Californians? Would that meet our needs? How shall we go in co-operative packing and selling? These are a few of the questions connected with marketing that need solution. The lemon industry, in which many are now investing, is an example of one whose fate depends alm-ost entirely on our success in curing and storing. Others have found it difficult. W~,hat methods are most likely to succeed here? For many of the problems connected with citrus fruits are of the first importance, and what a multitude of problems there are! Soils, fertilizers, stocks, propagation, varietes, cultivation, insects and diseases, marketing. These subjects will be sure to be so prominent in our discussions that I will not take time to more than enumerate them. At the present time the piiheapple claims, prominence as the most important Cuban horticultural product. This is and old-established industry in Cuba, and while its problemis are perhaps not so numerous as those connected with citrus fruits, many of them are sufficiently important to demand careful study. Only one committee was named to cover the whole subject of Cuban vegetables. Had the subject been divided and one assigned to each of the principal vegetable crops, all would have found enough to do, vegetable-growing is occupying the attention of a large proportion of our members, and some, at least, of its innumerable problems will doubtless receive your attention -at -this session. These questions of the commercial value of the many native tropical fruits and vegetables is one on which we have very meagre knowledge and on which it w ould be well to inform ourselves. Numerous profitable new industries in this line are doubtless only waiting for .intelligent development. The fruits of the temperate zone will probably always have for us only a secondary importance, but that we cannot afford to neglect them is shown by the success of one of our members with strawberries. Havana would furnish a fine market for grapes, peaches and other similar fruits if we finally learn how to produce them successfully. The subject of ornamentals is certainly an inviting one in this climate, where it is impossible to grow too great a variety of beautiful and interesting plants. Those of us who came here from the North find ourselves fairly bewildered by their abundance, and often also are at a loss to know how to obtain plants of the many beautiful things that we see in the old-established gardens. This want, which I think is felt by all new-corners, suggests that our nurserymen may be making a mistake in confining their attention too closely to the propagation of citrus fruit. mercial orchards planted on almost every type of soil that is found on the Island, and it is not probable that the same treatment will prove adaptable to all of then. It is needless to call attention to the importance of diseases and insects and to the great difficulty their study presents to the ordinary farmer or horticulturallist. Here more than almost anywhere else we all recognize the necessity for expert assistance. Fortunately, we have among us a few who are well qualified to give it. It was only after some discussion that the executive committee decided to include tobacco among the subjects for our consideration. While it is not strictly a horticultural crop, many of our members are more or less interested in its cultivation, and it was felt that no harmn could come from this widening of our field, especially in view of the great importance of tobacco in Cuiba and of the fact that the tobacco growers have no similar organization of their own. They are, therefore, heartily invited to join with us and help in building up a strong society, such as may quickly become an important factor in aiding the progress and development of the Island. While there is no intention, that this society shall ever become in any sense a political one, still there are many ways in which the laws and regulations of the government may specially affect our business, and it was deemed wise to appoint a committee on legislation and relations with the government. Bly means of such a comnmittee it will be possible to formulate our special needs and bring then officially to the attention of the proper authorities. secuingproper support to the experiment station; of changing our present absurd law governing the importation of citrus fruit trees and of obtaining some really effective regulations governing the inspection of nursery stock. The present newspaper agitation of the question of inspection of imported trees and plants is good as far as it goes, but when such a law is framed. it should provide for the inspection of local nurseries as well. Then, too in case our railroad fiends continue blind to their own interest, our committee might communicate with them through the Railroad Commission. These, gentlemen of the Cuban Horticultural Society, are, briefly stated, a few of the purposes for which we have formed this organization. The work is an important one, for the progress of the whole Island; land gentlemen, it is in your hands. Its success will depend entirely on the zeal and energy with which each and all of you take it up." Fruit culture in Porto Rico. "The island of Porto Rico contains 3,600 square miles. The interior is mountainous and in many instances the mountains reach all the way down to the coast, but usually the coastal region consists of undulating plains covering about one-tenth of the whole area. "The soil varies in character from coral sand at the seashore to heavy clay in the interior. There are, however, no well-defined boundaries and the soil varies much within limited areas. The temperature is very even. The mean annual being 78-- o and the greatest change is about i0 degrees. "The rainfalls vary greatly. In the mountains there may be as high as I5O-200 inches, raining about every day, in the year, while on the plains, especially on the north side of the island, it may be and usually is, very dry. "The labor is abundant and fairly good. A few years ago it was poor and poorly paid, but the laborers are gradually becoming more efficient and the wages are rising steadily. A laborer who three or four years ago received 30 and 40 cents a day now receives 50 and 65, and it is still rising. the steamers, which sounds reasonable enough, but in order to build up the fruit and vegetable industry quick it would be necessary to have the transportation first. The present ships are not fit for fruit transportation either. They are too slow and have neither ventilation nor cold storage. The freight is about 28 cents per box. with profit. Those wild oranges are usually of fine quality and ship fairly well if properly handled. "The planted groves in Porto Rico are confined nearly altogether to the north side of the island and comprise an area of about 7,000 or 8,ooo acres and I would estimate that about 70 per cent of that is planted to oranges, 25 per cent to grapefruit, and 5 per cent, to lemons. "The varietes cover about the whole list of those grown in Florida, where most of them came from originally. There are, however, very few varieties entirely true to name: either the changes have taken place in Porto Rico or else they were badly mixed when they were imported. As to the varieties best adapted to Porto Rico, it is yet too early to state. There is no question but that the early and late varieties would be the most profitable, but varieties like the Parson Brown, Tardiff and Lambs Summer have not yet shown a uniform time of ripening. "The blood oranges do not usually show the blood characteristic in Porto Rico. The naval orange is being talked of a good deal and there is every indication that it will do better in Porto Rico than it did in Florida. The grapefruit varieties are all bearing wvell, but there is a number of undesirable varieties planted. "The native varieties of oranges, of which there are numbers without end are usually very good and some of them are superior to any of the Florida or California varieties, and without a doubt one or more of them will eventually replace the existing ones. "Most of the growers practice clean culture and all recognize the need of commercial fertilizer. While there are yet some troubles to be overcome in Porto Rico in orange growing, it can safely be stated that the orange industry there is past its experimental stage. "Pineapples are now being cultivated extensively in Porto Rico. The Red Spanish is planted in preference to any other. The Porto Rico or Cabazana pineapple, is cultivated most extensively for canning and is well stuited for that purpose on account of being so large. "The methods of cultivation vary according to the class of soil, but usually planting is done on raised beds in one to four rows to the bed. Fertilizer is used all over, almost without exception, and the formula best adapted has been found to be very close to the one recommended in Florida. "It has been found that the Cabazona can be shipped successfully when properly handled and there is a good but limited demand for that fruit in the United States. A pine weighing from 8 to 20 pounds sells for from 50 cents to 75 cents in the fancy market. The canneries, of which there are three or four, pay 50 cents to 6o cents a dozen for Cabazona and for Red Spanish according to size. "I shall briefly touch on the mango and aguacate, not because I think that they are of minor importance, but because the industry is yet in its infancy. The Porto Rico Experiment Station has over twenty of the best mangoes of what is found in India and Ceylon, and a company has started a large nursery and expect to have a grove of 50 or IOO acres soon of the improved varieties. The mango grows very well indeed in Porto Rico and it is my opinion that it will be a paying crop there. Of course I do not mean to say that it would pay to ship the more common varieties, but there is a much larger demand for the improved fruit than can be supplied at present. "Of aguacates there are a number of good varieties, but there are also a number of worthless ones. They do not come true to seed and must, therefore, be budded or grafted, which is less difficult than building the mango. There are no commercial plantations of aguacate in Porto Rico, but several attempts have been made to ship the wild-growing fruit. Most of those experiments have negative, but it was found last year that the fruit car.ried well when shipped in cold storage, although the experiments were not continued long enough to determine the most favorable temperature." Progress of the Citrus Fruit Industry. "The native home of the orange is given in history as Southern Asia, and from here it was first started into other countries by the Arabians. "It is probable that they were carried both East and West. It was about 1,5oo A. D. that they were first brought to Portugal, and from this country they have spread over the whole of the Mediterranean region. Both oranges and lemons early became a prominent industry in this section. Their first introduction into the New World was probably into the tropical forest of the Amazon and other South American countries. The early explorers carried the seed here and soon the forests were full of the wild fruit. They ran wild there the same as the orange does in Florida, when it was brought by Menendez in I56o. "Our cultivated varieties of citrus fruits as we see them today are the selections from the choicer seedling from many different sections. Some have come direct from Palestine, others from Brazil, others from China and Japan, and many have been saved from the seedling groves that were so common in Florida. grade, pack, and ship so as to have the fruit reach the market of the Eastern cities in first-class condition. They are now placing oranges on the markets of England. It has been a long, hard struggle and an expensive one. "I was talking the other day with a man who owns a grove in California, and made the statement that probably there has been more money spent in the business to date than has been taken out by the sale of the fruits. That seems like a rather wild statement, but when we take into consideration the mistakes that have been made, land planted that was not suitable and has been abandoned, varieties planted that have not given profitable results and have had to be worked over, people who have gone into the business without counting the cost and have had to give away, and many other things that have cost money and brought no returns. "Mexico has several sections where oranges are grown and during years when Florida has had a short crop they have been placed on the markets of the United States at a profit. Jamaica and Porto Rico are also coming into the markets with considerable fruit. "This will show you, to some extent, what the output was at that time, and it has been increasing all the time. There was imported into the United States from other countries during the years 1903 and 1904, 3,589,326 pounds oranges and 171,923,468 pounds lemons. "The output of California during the year I9O6 was over 30,000 carloads. We also find that while there has been a rapid increase of the industry, it has made itself felt upon some other sections that have looked to a great deal of an extent upon the markets of the United States for an outlet to their output which was during i9oo, 7,001 200,000 boxes, and this has fallen to 88,ooo during the year 19o6. There has also been a marked decrease in the importation of lemons. We have now in a somewhat hasty and rough way traced the citrus fruit industry and shown where most of the crop comes from and to some extent about the amount produced. Now we wish to call your attention to the industry in this country, its progress and exent. Also if possible, to point out some of the main points along which success or failure are made. "The Beginning of the citrus fruit industry in this country dates practically with 1900o, for, while there were some groves planted before this, I believe that that year' can safely be taken as the beginning of the industry which cultivated varieties of fruits. This does not take into consideration the old groves of native fruits, for many of them are very old. Beginning with tlis date a good deal of capital was put into the business, and it began to assume the shape of a commercial enterpriseand the progress has been rapid during the last few years. ing, grading, shipping, etc. For if this country is going on the market to compete with other sections to make a name for itself, it must set the standard high, and this means that each grower must set a very high mark and live up to it. In all the fruit industries, the citrus fruits have the highest standards in the markets. A first-class box of fruit must be first-class in every way, if you are going to make a name that will last on the, markets of the United States. All fruit that is not first-class had better be sold locally or made up into some by-product. I wish here to give a little quotation from the West Indian Bulletin about the oranges in Jamaica: "In the years 1899 and igoo, when great quantities of oranges were shipped, much harm was done to the reputation of Jamaica fruit by wholes 'ale consignment of under-sized and immature fruit and other stuff rendered worthless by careless picking and bad packing. The trade can, I believe, be made to the Island more profitable than it has been, but this can be affected only by repairing and fostering the good name of Jamaica fruit in the markets of the United States and Great Britain. We all hope that such a report mn'ay never come about the fruit of this country, but there is a great deal in that par 'agraph for each one', and we all hope that each one will do his best to make a name for the fruit of this country. The idea seems to have gained quite a foothold in this country that citrus fruits require only a small amount of care to handle them properly, or, in other wo rds, all that is necessary is to plant a tree and sit in the shade until the fruit is ready to pick. My observaStion is that they require the most care of any fruit and that it is impossible to give them too much care and attention when it is done with reason and judgment. picking, packing, and shipping. How I wish that I could take up each point by itself, but time will not allow. I hope that each one will give these points his best thought and consideration. "In conclusion, I wish to say that I have great faith in the citrus fruit industry of this country. I believe that nature has done all that she can for the work, and that we have here no more or no worse insects and disease to combat with than many other sections where the business is made a success, but it is going to require careful, hard work and some of us. have got to get out of the shade and give more attention to the work, or go out of business." tomer, and requires all the ingenuity and patience of the genial commission man to keep him in good humor and hold his trade. A merchant has to hustle and plan to make things go, but this man is a merchant on both sides of the game; if he does not please the grower he can't get the goods to sell. It takes the very best business man material to make a successful commission man; slack-twisted or sleepy fellows can't play in that game; and even then he must rise at 2 o'clock in the morning and take three or four hours' start of the other fellows to keep up with booth. So it is plain that even his life is not all roses, but we hope he will not go out of business, for we could not do without him either as a distributer of our goods or as a never failing source to which to trace all our failures, the faults of our goods and our calamities in general. In fact, it appears as if the principal enjoyment some growers derive from their business is found in ventilating their feelings in abuse of that terrible robber, the commission man. But does he really deserve all the scoldings, criticisms and accusations he receives? If he does, he is, indeed, a hard citizen. But I am inclined to think that many growers do not only the commission man, but themselves and those around them, great injustice by allowing themselves to think and talk as they do, for, in the first place, we may think we have been robbed when we have not, and if we have been we should not abuse the commission man until we are sure whether the man who did it was a commission man. Fakers sometimes advertise themselves as new commission houses, solicit consignments, tell you how all the old houses are systematic robbers while they are strictly gilt edge and sell on 5- commission, remit promptly, etc., have your goods consigned to their new concern, whose office is a postoffice box and whosesalesrooms are the wharf, sell the goods, pocket the proceeds, and fail. of a lot of unjustified slander being heaped upon the real commission man who does a square and honest business, keeps a thorough and correct set of books, reports his sales and books them as they are made, and 'makes his checks to correspond. Many times our goods are reported d as arriving in bad condition, when it seems to us almost impossible that they should be so, but when our agents report such conditions, we should. look into the matter carefully and candidly, and try to find where the cause is, and I am sure that it will not in many cases be found in the commission house, but far more often is directly traceable to the railroad car, the perspiring hold of a vessel or to the rain that fell or did not fall on the field. In this spirit we can work together for the bettering of transportation, customs and duty regulations; in fact every feature of our important business, which, if we do justice to our opportunities, can be developed into one of -vast importance, and of generous profit to ourselves and to the commission man. "As chairman of your committee on pineapples and in the absence of other members of same, I beg to report. "The industry has been a prosperous one since its inception, except during the time of serious revolution. The growers are a very prosperous agricultural people. They are today the most prosperous agricultural people of the Island. "Raising pines is a good paying business, and the crop may be called a sure crop. While affected to some extent by, weather conditions, it in less so than any crop that I know of. In a season like the past six months of extremely dry weather the crop is late and the average size of the fruit is small, but there is a crop that is now bringing a good price in the markets in the United States. "The crop this year will go to a million crates. It would have gone to one million two hundred thousand if there had been favorable weather conditions during the past six months. "The great bulk of the Cuban crop is raised by the Spanish-speaking people, many of whom raise no other money crop. Among them are many who may well be classed as a farmers. There are about ten who raise crops of pines that are worth in the fields over $5o,ooo each. "There is no organization among the pine growers for the protection of their interests. I"There has been partial, spasmodic efforts made to organize, but the results are nil. With the natural increase of the business, organization must come, or there will be a great f alling of f of income to the growers. They, are now suttering great loss in caring for and marketing their product and the percentage of loss will be much greater in the future if they fail to organize. "This Horticultural Society may be of service to those engaged in the business, but I think at present there is pressing need of an organization for their special product. "Some twenty or more years ago the planters set pines on the rich, heavy black and mulatto lands as well as the red, but for some years past all Cuban growers have given up all but the best blood-red land. The Cuban planters know nothing of -fertilizing and they therefore do not try the poor sandy lands. That has been left for the people from the States to experiment with. 1, fully believe that the best shipping pines will be raised on the lighter, poorer lands. "Too much water as the fruit is maturing is fatal to the shipping quality of pines. The rich, heavy lands are more tenacious in holding water than the sandy lands and the pine plant takes up an excess of moisture if it is -in the soil to draw from. "Manner of cultivation, marketing, etc., may be left for future consideration. "We are all interested in this subject, either from the standpoint of the consumer or that of the producerpossibly from both. From either standpoint, it is worthy of a great deal more study than is usually devoted to it. In the following notes I hope to bring out a few points that may help some of us to better both the quality and the quantity of our sweet potato crop. -and these are usually several-or as to how many generations of potatoes have been grown, by this same method of vine cuttings without a return to propagation from the potato itself for a renewal of the vitality necessary for a large yield of tubers. "Planting sweet potatoes from vine cuttings, while a very necessary and economical method of propagation, is not a natural one, and vine cuttings planted year after year without a return to the tuber gradually lose their ability to produce large crops of tubers. This has been clearly demonstrated in tests conducted by me for the past two seasons at the Experimental 'Station at Santiago de las Vegas. with vine cuttings that had been propagated in that way for five known and probably many more unknown generations. The other plots were planted with slips ,grown from the potatoes themselves. The same variety of potatoes was planted int all plots. When dug, the plots planted with slips yielded four and one half times as much as the corresponding plots that had been planted with the vine cuttings. Surely a gain Of 350 per cent. in yield is worth considering in any crop. "There are several Cuban and American varieties that are of f air to good quality and give good yields. The names of the Cuban varieties are more or less local, and the name used in one locality may not be the name the same variety is called in another. However, I will give them for what they may be worth: "Papa" mnorado and Cinco dedos matojo are among the best Cuban varieties, and Red Nose, Southern Queen, Brazillian, Hanover Yams and Red Bermuda are some of the best American varieties. "When about to plant the potatoes themselves of the chosen variety should be procured and bedded close together but not touching one another and 'covered with ashes and fine earth or earth and sand to the depth of one inch, then covered with a straw or grass mulch loosely put on to a depth of three or four inches. "The bed should be kept moist, wvetting it thoroughly* when needed and then leaving until it shows the need of water again; the drainage should be good also so the water will not stand in the bed and thus rot the potatoes. In a few weeks the chips- will be six to eight inches long and ready to plant in the field, which should be in good tilth and ready to receive them. "WIAhere a large acreage is to be planted or it is necessary to economize in seed potatoes, vine cuttings can be made from the vines of these first slips as soon as they are of sufficient length. plant give such prompt and satisfactory returns as do sweet potatoes when good varieties are selected and proper care taken in their planting and cultivation, and few of our crops receive so little care and so luch abuse and still give us returns." Before breaking up the subject, let us turn aside for a moment and notice the habits and home of the trees, as found in their natural state. Nativity.-The members of the orange family are nearly all found growing wild on the plains and hills of southern India and China, and especially so on the great Malay islands south of Indo-China, where the members of the citrus group are now supposed to have had their birth. There are found growing other tropical trees of the forest and plains, where the soil is well drained, the rainfall exceedingly heavy and the temperature usually hot. Habits.-The vegetation of the world falls into three natural divisions, according to structure and habit of location, viz. hydrophytes, water, or bog plants; xerophytes, dry upland, or desert plants. Between these two extremes lies the intermediate group, known as mesophytes, in which the members of the genus citrus are located. Situated as they are nearly centrally between the dry land, on one side, water plants on the other, it is but reasonable to expect that any extended oscilation to extreme wet or dry, conditions would prove detrimental to the perfect development of tree and fruit. days, with less than one inch of rainfall in the entire time. The preceding months of July, August, September and the first part of October, were extremely wet, culminating with the excesive rain and cyclone of October 17. In all this time the soil was neccessarily in a sodden and umpliable state, and soon became very hard and dry when the rain suddenly ceased. Consequently, most of us found ourselves short of sufficient force to properly prepare all ground in time to preserve the moisture. First it was noticed that trees were influenced by the composition, depth, texture and cultivation of the soil as well as the kind of subsoil underlaying the orchard. Black soil, underlaid with gray or yellow clay carried six-year old trees through the season without losing many leaves in that part of the grove where the soil had not become dry before plowing. On the same kind of soil in another part of the grove where the ground was not plowed until the middle of December, when the top of the ground was quite dry, and broke up in clods. The trees on this ground are about half dead, and more than half the top must be cut away, because the soil could not be made fine enough to prevent evaporation and drying of the subsoil. Gravel soil, with clay and gravel sub-soil, has held the trees well through the season without injury to the trees themselves and they lost but little of their foliage and the best of them set a good crop of fruit during the driest part of the season. The soil was kept in fine tilth by frequent harrowing. Clay loam.-Trees six years old, growing on this kind of ground, lost their foliage early in the season before all the fruit was gathered. Some of them( stood four months without leaves, but in this (late are in full flush of growth and bloom and promising a good crop. entirely dead, while others have been removed, the ground prepared for the planting of new ones. As to Stock.-It was further observed that trees bud(led on lemon stock have only lateral roots, and in the driest positions were the first to show the lack of water. Out of seventeen large trees that were taken up all the roots were within I to i4 inches of the surface; all these were on lemon stock, none of which had roots that made any attempt to go downwards much beyond the depth in which they were planted, though the soil was such that would encourage a downward thrust of the roots if they were of that nature. With good intention most of the trees were planted high to guard against the effects of excess water in the wet summer time; as might be expected, such trees were the first to show the lack of water. Since the trees were planted, cultivation was carried on mostly by disk plow and harrow. In working with a disk the earth is invariably thrown toward the trees; thus, in a few years we find the trees standing on a high square mound of soil and a dead furrow running each way between the rows. In this form the ground dries more rapidly than if a level system of cultivation is followed. A few trees have been badly retarded by this form of culture. Further observations were made as to fertilizers and the results are quite obvious. Where 15 pounds of fertilizer was used the trees are robust and of much darker foliage; and are now throwing a more vigorous flush of new wood and flowers, than those that only had an application of eight pounds to the tree. Tangerines and navels seemed to be most affected by the dry weather, especially tangerines began to fold their leaves before the fruit had fully matured, about December Ist. Many trees throughout the grove were injured by the larva of Pachneus Litus, which feeds on the bark of the roots during the fall and winter. If the season had been ordinarily wet most of the trees that were affected would have recovered themselves without any apparent damage; as it was, we lost a few of our best trees, and many others are in bad condition. Many of the trees set flowers freely during the winter, such flowers were set mostly on the inside spurs, where the choisest fruit is usually grown and, of course, dropped off without setting fruit. There is a possibility of another one or two flushes of bloom, but the fruit is usually of a coarser texture and minor flavor when set on young growing twigs on the outside of the tree. It is still a question among growers in different parts of the orange growing world as to whether orange trees of bearing size should be kept constantly growing, or whether they should be brought to a state of inertia before flowering for the following season. In looking up this subject, I find that the experienced growers in such dry countries as Algiers, Tripoli, Palestine, upper Syria and India, where irrigation is practiced; the trees are purposely retarded at a certain time, depending upon the time when the fruit is wanted. Modus operandi.-The growth having been brought to the proper state of maturity, the soil is then drawn away from fifteen to twenty days, or until the leaves have all fallen off. Heavy mulches of compost are spread over the roots, the trees copiously watered and the earth returned to its former place. This practice has been especially carried on in the section of Nagpur, India, where oranges have been successfully grown for hundreds of years. By this method of intense culture the groves of Nagpur have long since had a wide reputation for their luscious fruits. The question of varieties of citrus fruits to plant in Cuba today is a very important one. \Ve have not reached the position of older sections like Florida and California along this line, for they have practically decided which are the best varieties to plant for home use and commercial growing. \We have to decide this point for ourselves, and it is going to take a good many years to do it. The discussion of varieties is always very interesting, for so much depends upon the location, soil, care, etc. 'he grower himself also has a good deal to do with the success or failure of a variety. It is impossible at the present time to say which are and which are not the best varieties to plant for this country. The groves are too young to give anything like definite results for the different kinds of soil planted. In order to gather some idea of what varieties are most commonly planted, I wrote to many of the leading planters for a list of varieties planted. These answers show that many of the leading commercial varieties of Florida have been planted, and if all groves, when they come into bearing, are the same as those around Santiago de las Vegas, there will be many other varieties also. Valatia or Hale's H art's late is by far the most commonly planted, followed by Pineapple, IParson Brown, Washington Navel. According to the reports received, more or less of the following varieties have been planted: Jaffa, Joppa, King, Centennial, Enterprise, Boons' Early, Homassa Native, Medium Sweet. Iandarins. )ancv Tangerine, Willow-leaved M\1andarin. commonly planted, followed by Excelsior, Triumph, Rernambus, Florida Standard Duncan, Alonzo, Bowens' Late, Royal. It has been rather hard to answer to varieties of pomelos, for many are simply grape-fruit. Which of these varieties or of others that may be planted will stand the test of time and become varieties for either home or commercial growth, time alone can tell, and it will take several years to find this out. During the past few years we have had an opportunity to observe to some extent the way that some of the leading varieties behave themselves in this country. 'The groves around Santiago de las Vegas have been producing some fine fruit. Each must understand that the trees are young, and as time goes on we may have to change the observations as given here. Many of the varieties that we give in the list we have not seen growing, and can say nothing further than has been said. In this report we shall not attempt to give a description of the fruit, but shall confine ourselves to a few general remarks as to how the different varieties do here. Pineapple medium in size, prolific, colors well, early and hangs on the tree until mid-season in fine condition; flavor very fine. It impresses me as a very fine orange when well grown, but will require a good deal of attention to get the size large and the fruit handsome. Parsons' Brown small to medium, prolific, colors on ly fairly well, early, but does not hang long without losing flavor; flavor rather poor, being sweet and flat. It is a variety that I think will require a good deal of attention to produce in good shape. Washington Naval medium to large prolific, colors poorly, early, hangs on tree only fairly well: flavor fine. the results are very doubtful from a commercial standpoint. Jaffa medium in size, very prolific, colors well, midseason, hangs on tree well; flavor very fine. A very handsome orange, but I think it is a little out of season for this country. Joppa medium to large, prolific, colors well, mid-season to late; flavor fine. Valencia late medium to large, prolific, colors poorly, late, hangs on tree well, flavor fine. A grand orange, but will require a great deal of work to produce it in fine shape. King, medium to large, prolific, mid-season to late. hangs well, colors very poorly, flavor fine. To give this variety color it will require plenty of work. prolific, colors fine, early, hangs on tree well, flavor very fine. A very hand some orange and one that can be grown almost to perfection when given good care. Willow-leaved Mandarin, medium to large, prolific, colors good, early flavor fair. This orange is rather soft and loose skinned. It does not impress me as having any commercial value here. Pomelos.-Walters' large, prolific, colors well, early, and hangs on late in the season; flavor mild and very fine. A very choice variety. Marsh Seedless, small to medium, very prolific, colors well, mid-season, to late, flavor fair, bitter principle well marked. A good commercial sort. McKinley, small to medium, very prolific, colors well, late, hangs very late, flavor very fine when fully ripe, the bitter principle very marked until very late in the season. This variety resembles Marsh very much in outward appearance, but has from 50 to 70 seeds. much milder, pleasanter taste for the bitter principle is much less marked than in the smaller types. Royal medium too large, colors well, early, and hangs on tree until late in the season, flavor sweet, preferred by many to the other types. This is a native variety of Cuba and there are a great many varieties. Personally I believe that if the better types of this variety are selected and sold upon the market as sweet pomelo that it will make a name for itself. Kumquats, both varieties, do well here, but what their commercial standing will be we cannot tell yet. They should be grown for home use, for they are almost always in fruit and produce a fine fruit both for hand eating and sauces. Limies.-Tahati, Persian or Seedless, medium to large, colors well, very prolific, acid strong, season long, keeping qualities poor. What little I have seen of it, it does not seem to have much future here from a cc,-,-, mercial standpoint. It is not a good keeper in comparison to our many native limes. To me the native lime giv'es greater promise and I believe that it can be successfully grown. Lemons.-Villa Franc-medium to large, thinskinned, fine flavor, colors well, prolific. Before closing this report I wish to say a word in favor of the native seeding orange, for ever since I have been here the choicer varieties of them have appealed to me very m-uch. There is certainly some very choice native varieties, many of them are well worthy of propagation. Sometimes I am inclined to believe that the future of the orange business lies in the selection and propagation of those native varieties over the ones now commonly planted. We have done some collecting of these varieties at the station and will be glad to receive bud wood from anyone who knows a good variety and put it with our collection, so as to give it a trial. S. S. Harvey reviewed the work of seedling culture in Florida, this work finally producing one of the best oranges grown. The fact was emphatized that Cuba has some of the finest native oranges ever grown anywhere. C. \Westenkamp, speaking from an experience of two years in Cuba and twenty-two years in Florida, claimed that the variety of the fruit had less to do with quality than the soil. Illustrates by stating that a Florida man raised oranges on one side of a river that commanded a price of $i.oo per box more than that raised by neighhors on the other side of the river. Advised budding from a good fruit tree regardless of name or variety. Claimed unknown root stock sold by ignorant or unprincipled nuserymen was going to do a great deal of harm to local citrus interests. Advised sour orange stock as the only stock for Cuba. G.. NV. \lace agreed with former speaker regarding sour orange stock and said that that stock had a better, stronger tape root. S. L. Laughlin advised using native stock as much as possible as they would be more apt to be successful being adapted to the country. Thought seedless oranges on sour stock would be all right. L. Collins inquired about the difference between rough lemon and sour orange stock as to shape, susceptibility to disease, growth, etc. Thos. R. Towns stated that there was a wide difference between the rough lemon and the sour orange stock. Both have tape roots, but the lemon is a surface feeder, while the sour orange feeds eight to ten inches below surface. Claimed sour orange more liable to attack from insect pests than the lemon. Found no difference in growth at end of five years. It was the opinion of Prof. Earle that it would be necessary to have different stocks for different soils. A. 0. von Hermann thought that perhaps poor navel fruit was caused by poor varieties of navels. in. P. Ladd stated that he had good navels and the trees yielded well. J. Ht. Kydd stated that in Ceballos they raised a fine looking navel, but the fruit was no good, solid but dry. Soil medium sandy. H'. E. Havens asked for information about the different varieties of citrus fruits, as to the time they could be put on the market. H. R. Towns in reply said that the Cuban crop would be from four to six weeks ahead of the Florida crop. Prof. Baker stated that he had found native Cuban oranges on the market at Camagfiey during August, of poor color but marketable. S. S. Harvey thought we could not have fruit mattire during the rainy season as this would give them poor marketable qualities. C. Westenkamp agreed with former speaker as to trying to mature fruit during the wet season. H. R. Towns advised planting early varieties rather than late and getting the crop on the market ahead of Florida. Thinks irrigation necessary so as to get an early bloom. Prof. Austin said crop was late this year account of drought. Motion carried that we pass to another subject. S. L. Laughlin expressed a fear that the American market would become over stocked with citrus fruits in a few years, and though the foreign markets ought to be investigated with a view of taking the surplus. Several members disagreed with this view and thought the demand would equal the supply for a long while yet. W. P. Ladd stated that a great deal of the California land that had been planted to groves was not suitable for raising citrus fruits and would be abandoned. him that in his opinion the amount of land in groves in California had reached the limit. Pres. Earle thought that on account of the difference in seasons we need not fear competition from California fruits'. S. S. Harvey advised very strongly the planting of more lemon groves. It will be impossible to treat this subject in all of its phases within the time allotted for this paper; we will, therefore, only attempt to give a general sketch of the work. The subject of itself deserves the close attention and careful study of all interested in the citrus industry. It is the careful study of the small details that produces the paying results, and especially is this true during the tender age of a transplanted tree. A seemingly slight damage done to a young tree has a lasting effect, and on the other hand with right treatment a citrus tree responds quickly and with paying results. Nurse a young tree a few months and you will have taken a long stride in producing a profitable tree. For convenience sake we will divide this subject into two parts, viz: tillage of the soil and treatment of the tree. ed depends upon his judgment in deciding the best method. The object of cultivation is thereefold: namely, retention of plant fruit, retention of moisture, and the forming of a perfect root system. By the retention of plant food I mean the saving of the elements of the soil from being absorbed by superfluous grasses anl 'weeds, and especially those classes which take from rather than give to soil. The retaining of the moisture through tillage by placing the top soil in such a fine state of texture that the evaporation cannot take place. The loose soil acting as dust curtain protects the lower strata containing the moisture. The forming of a perfect root system is done by placing the ground in such a condition that the roo~ts can seek food, air and moisture in all direction easily. If the ground or soil be thoroughly pulverized the plant food will be more evenly distributed through the soil and this will influence the roots to spread throughout the soil evenly, and a balanced root system will be the result. There are several classes of cultivation, namely, clean cultivation, no cultivation except with the hoe, and clean cultivation with a cover crop. considered especially 'The cow pea and the velvet bean have planted in Cuba sufficiently to prove beyond a doubt the good results'. The amount of tillage that is necessary will, of course, depend upon the texture of the soil and the class of grasses that has to be contended with. The main point to be worked for is to keep the soil in such a condition that the roots can seek food in all directions easily, in other words, build up the root system. The class of tools which will serve best will depend upon the class of tillage adapted and the soil, including the class of grass that has to be f ought. The common turning plow gives good results in breaking of the ground and will be used with advantage in the sandy soils in the grove work, but would be useless in the heavier soils during the rainy season. The disk plow, on the other hand, can be used in all classes of soils, and especially will it do good work where a cover crop is to be turned under. The disk harrow answers the purpose of a harrow on the same principles as the disk plow, as it tends to press everything into the ground rather than tear it out. If the reversible disk harrow is used the ground may be kept comparatively level. more of one element and another will require more of another element and this will have to be studied out. I do not think that fertilization has been overdone in Cuba. The time to fertilize is (luring the dormant season and then when the tree starts it has the food ready for the assimilation. Perhaps twice a year, in the fall or early winter and then again in midisummier. The protection of the tree is of the greatest importance and can only be done by every (lay watchfulness. The scale here in Cuba has niot been alarming as vet and in most cases our spraying of some good spray will prlove sufficient for one year. For the rust mite it may be necessary to spray more as the case may require. The prunning should be done judiciously so as to save all growth possible. If care is taken to get the trees started in the right direction very little prunning will be needed. Of course the water shoots will have to be taken during the growing season. The ant pest has given a great deal of trouble in the past, but with the present methods they can be cop~ed with very successfully. The Bibiagua can be kept in check by the use of sulphur fumes blown into their beds by the sulphur furnace with bellows. The smaller ants which foster the scale may be held back with the so-called treetangle foot applied upon the trunk of the tree. This prevents the ant from crossing. Our most dangerous pest is the root grub which girdles the bark from the root of the tree and if allowed to continue will destroy the tree. After the grub has entered into the ground it is hard to check its work, so we have to resort to the preventive, that is the picking of the beetle which lays its eggs on the orange leaf the produces the grub. The beetle appears about the 19th of April and lasts during two months; that is the most of the beetles disappear at that time, although you can find the beetle all of the year. If the beetle is handpicked twice a week from April 20 till June 20 the grub may be kept in check very well. proper amount of roots in a balanced system and can protect them properly in the top of the tree will give us very little trouble. If we have the root with plenty of food we are oil the road to get a producing tree. Mr. Towns, speaking on treatment of citrus trees, said that a good tree-properly started and taken care of in the right manner would make its owner prosperous and happy. Too many growers are ignorant of the proper care to give trees. He advises plowing of beds about six furrows wide at first as that would be sufficient when the tree is first set out. Additional furrows could be plowed as necessary. Advises heeling in trees when first received from nursery, and watered thoroughly. This gives the roots a chance to sear over before the tree is exposed to the hot sun in the field. Leave heeled in for from a week to a month and put in the field when weather is favorable, giving.each tree five gallons water. In answer to question by Mr, Van Hermann as to the proper time to transplant from seed bed to nursery row, Air. Towns answered "At age of about one year." Mr. Ladd took exceptions to Mr. Town's advise to burn land to clear of grass. Mr. Ladd advocated plowing under everything possible. Report on Packages and Packinq. The question of packages is one of importance, for in a very short time the consumption will be in the millions, and it behooves us to see that some (lay we are not found to be short of material to export our products with. We should always use the standard package and the best package obtainable, and not the cheapest. \e think it might be better to use a little heavier or stronger crate for tomatoes, and all products packed in the six basket carrier, as that crate is very frail, considering the treatment it goes through here, and also in the States. in the manner of loading and unloading. We think it would be well for us to see if we could arrange some way whereby all crate material could be imported under bond, and exported in the same manner with the products of the Island and thereby save duties both ways. We understand that our United States Consul will assist us in any way possible, and also think it may be done successfully. It will be well to investigate the manufacture of our crate material out of native woods, nd to find out, if possible, if it would be practical. We think the question of patents on an old-established manufactured article like the crates we use here is preposterous, to say the least, and unjust; and also think they have no right whatever, but would suggest that a committee be appointed to look into the legal status of this, and see what could be done in the wav of bringing crates in under bond. ducts are always quoted lower than similar products from Florida and California. To pack well we must grade well. Grading and packing well will make pleasant relations many times between shipper and commission man, where many times there arises a belief in the shipper's mind that he is being robbed, and the commission man thinks the grower is not trying to put up an honest package. Let every grower and packer bear in mind that it is quality and not quantity that pays in the fruit and vegetable business. The question of the crate industry led to a very heated discussion. A firm had obtained a so-called patent on a crate that had been use for many years, and now deinand that a royalty of one cent a crate should be collected by them for every crate shipped into the Island. This the shippers resented unanimously, but stated at the same time that they were willing to purchase crates from any manufacturer of Cuba who could supply the demand at better prices than they could obtain them in the States, and would certainly give them the business, but allowing a firm to monopolize the business and demand a royalty from either them or the manufacturer was a most unpleasant state of affairs. A committee was appointed to obtain the legal standing of the patent and report same. Prof. C. F. Baker gave a talk on soiling and cover crops, exhibiting examples of many plants now being tested in the gardens connected with his department at the Estacion Agronomica, for those purposes. He points out the great value of velvet beans as a soiling and cover crop, and indicated some reasons why cow peas did not always serve the purpose, calling attention to the fact that both of these were only of use in the sumnmer. He spoke of the great importance of perennial cover crops for many purposes, as for instance in orchard work and metioned tests of such crops at the Estacion, citing Dolichos lablab, a native Bradburya, Pachyehizas, Teramnius, and two Calopogyon iums as being things of great promise. He told of some striking results with the East Indian Phascolna chrysanthus which seemed to place it at the least on a par with the velvet beans for some purposes as a summer soiling and cover crop. He spoke also of a remarkable short time summer cover crop which could be used with remarkable effectiveness when it was desirable to produce a heavy crop ready for plowing under within six to eight weeks. This plant, known as Aeschynomeinie cannabina and coming from the East Indies, has given the most flattering results after repeated trials at the Estacion Agronomica. Mr. Roberts, in speaking of the vegetable crop at Gilines, said the past season had been one of the best ever known, the principal crop being tomatoes and Irish potatoes. Stone tomato and Bliss Triumph and Early Rose potatoes gave best results with them. Potatoes for first crop were planted about middle of October, to the first of November. Second planting, middle of January to February ist. Yielded six, seven and eight barrels to each barrel planted. Report on Marketing and Storing. I consider this question of marketing and storing of fruits one of the most important and one that should receive a great deal of attention. In California nearly every department have their own organization, the orange, the peach, the nut, each have their own separate organization to look after their peculiar interests. The speaker thought that in time we would have to come to the same condition. Quite a heated discussion took place when representatives of the Cuban Trade Company tried to explain satisfactorily why there was to be a tax of one cent on each crate not purchased from them. The represv~tives tried to prove to the society that this tax would finally work to the benefit of the shippers, but failed to make their plea good. Moved and seconded that above matter be referred to committee on package and legislation. Passed. On the chairman leaving the question of hearing further explanations regarding this matter to the society, the society voted the question closed. Moved andl seconded that we take up the subject of quarantine regulation of citrus trees. Passed. Moved and seconded that a committe be appointed to confer with Governor Magoon on this subject. Considerable discussion followed regarding the present citrus tree quarantine law, whether or not it was suited to present condition and if so why it was not enforced, the opinion being that the law as it now stands was entirely inadequate for present needs. Resolution was adopted, that a committee be appointed to confer with the proper authorities to the effect that a suitable quarantine law be enacted for the protection of Cuban agricultural interests. The last boats built by the Ward Line have been provided with means of refrigeration facilities, and we ought to encourage this move on the part of the boat line, by experimenting with the different fruits and vegetables, and find out the amount of benefit to be derived from refrigeration. Geo. Reno, with the So. Pacific S. S. Line, said that no one had ever approached them regarding refrigerator service, and would be glad to have a committee confer with his Company about said service. Mr. Reno also called attention to the company lately formed and located at 61 Habana St., that claimed to have a liquid preservative, harmless to fruit and vegetables, but which would keep articles treated in good fresh condition for several da s. Some time was given a representative of this company to explain something of the benefits to be derived by using this preservative. Cul. Harvey stated that there was nothing valuable to growers in preserving fluids. A a rule they were fakes as applied to preserving fruits and vegetables that are to be marketed. The Society had better let such .things severely alone. The matter should left to each individual to satisfy himself. Pres. Earle thought that if the transportation companies were approached in the proper spirit, that they would work with the shippers with the end in view of getting the products on the market in better condition. ages from consignor to consignee, and strongly condemned the lighterage system. Says the the lighterage interests give no receipt for packages handled, and thinks perhaps considerable of the shortage might be traced to this cause. Prof. C. T. Baker gave a talk on wind-brakes, calling attention to the urgent necessity of good windbrakes for Cuban orchards. As evidence of this necessity he cited the large percentage of blemished fruits from some orchards due to wind premises. For the back-bone of the wind-brakes he recommends such rapidly growing and very strong trees as mango, Cuban cedar and Eucalyptus robustus. He advised that all these be grown from seed, sprouted in sand, pricked out into flats of rich earth and then into small boxes or 6 inch pots until ready to set out. He suggested that to perfect the wind-brake it be flanked with thickly planted rows of Hebiscus, Aralia or Acalypha-all common ornamental shrubs in Cuba and easily propagated from cuttings. To those who desired an impassible hedge within a short time, he suggested Acacia Arabica planted two feet apart. First, Superiority of the quality of the fruit grown. Second, Speedier means of reaching northern markets than either of the orange growing sections of the United States, being nearly two thousand miles nearer New York than California, and having an all-water route of about three days from Havana, thus reaching the markets more speedily than is possible for those sections, they being dependent entirely upon Railroad transportation. Third, Cheaper transportation by reason of all-water route-which considerably outweighes, in cost, the tariff paid on Cuban fruits sold in the United States. Fourth, Freedom from all danger of frost, which secures safety of the crops at all times. Fifth, Abundant rainfall during the summer when the trees are growing wood and fruit, and a dry season during the fall and winters when fruits are maturing, thus insuring the quality of the fruit as the best that is produced. RESOLVED that as a section for the profitable culture of Citrus Fruit, we believe that Cuba has superior advantage over any part of the United States, or of the world, and we recommend the growing of such fruits to all who may desire to make remunerative investments of Capital and labor. The following officers were elected for the coming year. President F. S. Earle, Herradura. Vice-President, G. W. Mace, San Crist6bal. Secretary, A. B. Storms, Herradura. Treasurer, L. S. McIrwin, Guanabacoa. C. F. Austin, Santiago de las Vegas. Prest. F. S. Earle, ex-officio. Resolved that it is urgently requested of all comnmittees that written reports on all subjects should be made. It being utterly impossible to get up a creditable report of proceedings from verbal reports. Mr. Laughlin moved that a vote of thanks be given the Havana Post for space given and for its efforts to further the success of the society; seconded by Mr. Collins and unanimously passed. Moved and seconded that a hearty vote of thanks be given the authorities of the hall for the kind tender of the use of the hall for the meetings of the society. Unanimously passed. Pres. Earle brought uip the subject of holding a midwinter exhibit of Cuban fruits and vegetables. After some discussion a motion was put before the meeting to hold an exhibit about the middle of Feb'y. and was passed unanimously. Moved by Jas. Leahy and seconded, that the Pres. and Officers receive a hearthy vote of thanks for services rendered the society. Passed. Moved and seconded that the transportation committee take up the matter of rates to annual meetings. Passed. Moved and seconded that the matter of holding exhibit and annual meeting at the same date be lef t to the executive committee. Passed. Moved and seconded that society adjourn subject to call of executive committee. Passed.